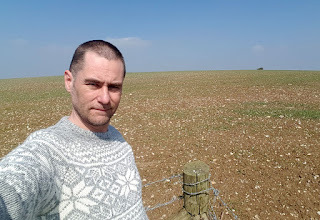 In April I was lucky to spend a few days with a good friend in Hastings, on the way home I drove fairly close to a high point I had not yet done, so it was time for a quick stop off to see it. The highpoint in question is called Bullock Hill, the highest point of Brighton, found to the east of the city it is 195 mts above sea level and has views over the city. I parked up not too far from the summit and walked along a few country paths (avoiding the dog mess) to get to a point as near as I could from the top. The field that the high point was situated in was full of crops so I avoided entering the field just in case but I did get as near as I could.